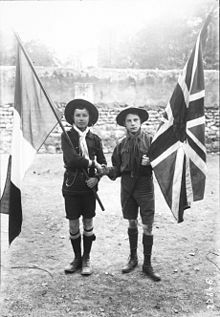 The Entente Cordiale (French pronunciation: ​[ɑ̃tɑ̃t kɔʁdjal]) was a series of agreements signed on 8 April 1904 between the United Kingdom of Great Britain and Ireland and the French Republic which saw a significant improvement in Anglo-French relations. Beyond the immediate concerns of colonial expansion addressed by the agreement, the signing of the Entente Cordiale marked the end of almost a thousand years of intermittent conflict between the two states and their predecessors, and replaced the modus vivendi that had existed since the end of the Napoleonic Wars in 1815 with a more formal agreement. The Entente Cordiale was the culmination of the policy of Théophile Delcassé, France's foreign minister from 1898, who believed that a Franco-British understanding would give France some security against any German system of alliances in Western Europe. Credit for the success of the negotiation belongs chiefly to Paul Cambon, France's ambassador in London, and to the British foreign secretary Lord Lansdowne. The most important feature of the agreement was that it granted freedom of action[clarification needed] to the UK in Egypt and to France in Morocco (with the proviso that France's eventual dispositions for Morocco include reasonable allowance for Spain's interests there). At the same time, the UK ceded the Los Islands (off French Guinea) to France, defined the frontier of Nigeria in France's favour, and agreed to French control of the upper Gambia valley, while France renounced its exclusive right to certain fisheries off Newfoundland. Furthermore, French and British zones of influence in Siam (Thailand), which was not to be colonised, were outlined, with the eastern territories, adjacent to French Indochina, becoming a French zone, and the western, adjacent to Burmese Tenasserim, a British zone. Arrangements were also made to allay the rivalry between British and French colonists in the New Hebrides. By the Entente Cordiale both powers reduced the virtual isolation into which they had withdrawn—France involuntarily, the UK complacently—while they had eyed each other over African affairs. The UK had no ally but Japan (1902), of little use if war should break out in European waters; France had none but Russia, soon to be discredited in the Russo-Japanese War of 1904–05. The agreement was upsetting to Germany, whose policy had long been to rely on Franco-British antagonism. A German attempt to check the French in Morocco in 1905 (the Tangier Incident, or First Moroccan Crisis), and thus upset the Entente, served only to strengthen it. Military discussions between the French and the British general staffs were soon initiated. Franco-British solidarity was confirmed at the Algeciras Conference (1906) and reconfirmed in the Second Moroccan Crisis (1911). A cartoon on the Entente Cordiale from Punch, with John Bull stalking off with the harlot Marianne (in what is supposed to be a Tricolour dress) and turning his back on the Kaiser, who pretends not to care. The tip of the scabbard of a cavalry sabre protrudes from beneath the Kaiser's army overcoat, implying a potential resort to force. The French term Entente Cordiale (usually translated as "cordial agreement" or "cordial understanding") comes from a letter written in 1843 by the British Foreign Secretary Lord Aberdeen to his brother, in which he mentioned "a cordial, good understanding" between the two nations. This was translated into French as Entente Cordiale and used by Louis Philippe I in the French Chamber that year. When used today the term almost always denotes the second Entente Cordiale, that is to say, the written and partly secret agreement signed in London between the two powers on 8 April 1904. The agreement was a change for both countries. France had been isolated from the other European powers, mostly as a result of the efforts of German Chancellor Otto von Bismarck to estrange France from potential allies, as it was thought that France might seek revenge for its defeat in the Franco-Prussian War of 1870–71. The United Kingdom had maintained a policy of "splendid isolation" on the European continent for nearly a century, intervening in continental affairs only when it was considered necessary to protect British interests and to maintain the continental balance of power. The situation for both countries changed in the last decade of the 19th century. The change had its roots in a British loss of confidence after the Second Boer War, and a growing fear that the country was isolated in the face of a potentially aggressive Germany. As early as March 1881, the French statesman Léon Gambetta and the then-Prince of Wales, Albert Edward, met at the Château de Breteuil to discuss an alliance against Germany. The Scramble for Africa prevented the countries from coming to terms, however. On the initiative of Colonial Secretary Joseph Chamberlain, there were three rounds of British-German talks between 1898 and 1901. The UK decided not to join the Triple Alliance, broke off the negotiations with Berlin, and revived the idea of a British-French alliance. The British and French colonial empires reached their peaks after World War I, a reflection of the power of this agreement. When the Russo-Japanese War was about to erupt, France and the UK found themselves on the verge of being dragged into the conflict on the side of their respective allies. France was firmly allied with Russia, while the UK had recently signed the Anglo-Japanese Alliance. In order to avoid going to war, both powers "shucked off their ancient rivalry" and resolved their differences in Africa, the Americas, Asia, and the Pacific. Toward this end, French foreign minister Théophile Delcassé, and Lord Lansdowne, the British Foreign Secretary, negotiated an agreement on colonial matters, and Lord Lansdowne and Paul Cambon, the French Ambassador to the UK, signed the resulting convention on 8 April 1904. The first and most important document was the Declaration respecting Egypt and Morocco. In return for the French promising not to "obstruct" British actions in Egypt, the British promised to allow the French to "preserve order … and provide assistance" in Morocco. Free passage through the Suez Canal was guaranteed, finally putting the Convention of Constantinople into force, and the erection of fortifications on part of the Moroccan coast forbidden. The treaty contained a secret annex dealing with the possibility of "changed circumstances" in the administration of either of the two countries. The second document dealt with Newfoundland and portions of West and Central Africa. The French gave up their rights (stemming from the Treaty of Utrecht) over the western coast of Newfoundland, although they retained the right to fish the coast. In return, the British gave the French the town of Yarbutenda (near the modern border between Senegal and The Gambia) and the Iles de Los (part of modern Guinea). An additional provision dealt with the border between French and British possessions east of the River Niger (present-day Niger and Nigeria). The final declaration concerned Siam (Thailand), Madagascar and the New Hebrides (Vanuatu). In Siam, the British recognised a French sphere of influence to the east of the River Menam's basin; in turn, the French recognised British influence over the territory to the west of the Menam basin. Both parties disclaimed any idea of annexing Siamese territory. The British withdrew their objection to the French introducing a tariff in Madagascar. The parties came to an agreement which would "put an end to the difficulties arising from the lack of jurisdiction over the natives of the New Hebrides". It is unclear what exactly the Entente meant to the British Foreign Office. For example, in early 1911 following French press reports contrasting the virility of the Triple Alliance with the moribund state of the Entente Eyre Crowe minuted: "The fundamental fact of course is that the Entente is not an alliance. For purposes of ultimate emergencies it may be found to have no substance at all. For the Entente is nothing more than a frame of mind, a view of general policy which is shared by the governments of two countries, but which may be, or become, so vague as to lose all content." The Triple Alliance collapsed when Italy remained neutral at the outbreak of World War I, while the Entente endured. The hundredth anniversary of the Entente cordiale in 2004 was marked by a number of official and unofficial events, including a state visit to France in April by Queen Elizabeth II and the Duke of Edinburgh, and a return visit by President Chirac in November. British troops (the band of the Royal Marines, the Household Cavalry Mounted Regiment, Grenadier Guards and King's Troop, Royal Horse Artillery) also led the Bastille Day parade in Paris for the first time, with the Red Arrows flying overhead. At both London Waterloo International and Paris Gare du Nord, the flags of the United Kingdom and of France were depicted connected with the words 'Entente cordiale' superimposed on posters. Some French political leaders had complained about the name "Waterloo" for the destination of trains from Paris because the British terminus is named after the 1815 battle where a British-led alliance defeated Napoleon's army, and in 1998 French politician Florent Longuepée wrote to British Prime Minister Tony Blair demanding, without success, that the name be changed. In November 2007 St Pancras International became the new London terminus for the Eurostar service. The name "Entente Cordiale" is used for the Entente Cordiale Scholarship scheme, a selective Franco-British scholarship scheme which was announced on 30 October 1995 by British Prime Minister John Major and French President Jacques Chirac at an Anglo-French summit in London. It provides funding for British and French students to study for one academic year on the other side of the Channel. The scheme is administered by the French embassy in London for British students, and by the British Council France and the UK embassy in Paris for French students. Funding is provided by the private sector and foundations. The scheme aims to foster mutual understanding and to promote exchanges between the British and French leaders of tomorrow. The programme was initiated by Sir Christopher Mallaby, British ambassador to France between 1993 and 1996. ^ "Entente Cordiale (European history) – Britannica Online Encyclopedia". Encyclopædia Britannica. Retrieved 8 March 2010. ^ a b "Waterloo insult to French visitors". BBC. 6 November 1998. Retrieved 21 June 2007. ^ Webster, Ben (12 March 2004). "Passengers ready for a second battle of Waterloo". London: The Times. Retrieved 10 April 2008. ^ Franco-British Council (2001). Crossing the Channel (PDF). ISBN 0 9540118 2 1. ^ Wilson, Iain (2010). Are International Exchange and Mobility Programmes Effective Tools of Symmetric Public Diplomacy? (PDF). Aberystwyth University. p. 52. Langer, William L. The Diplomacy of Imperialism, 1890–1902 (1951). Rolo, P. J. V. Entente Cordiale: the origins and negotiation of the Anglo-French agreements of 8 April 1904. Macmillan/St Martin's Press, London 1969. This page is based on the Wikipedia article Entente Cordiale; it is used under the Creative Commons Attribution-ShareAlike 3.0 Unported License (CC-BY-SA). You may redistribute it, verbatim or modified, providing that you comply with the terms of the CC-BY-SA.